If someone else is using your computer or if you need to see what changes were made to your files and folders during a specific time, you can use Nirsoft’s handy FolderChangesView application. Nirsoft is a great freeware provider that produces amazing little tools for your PC, and the best part is that they never bundle crapware with their programs like so many other software vendors do. What is Folder Changes View? Once you are ready to begin, you will need to download the FolderChangesView utility from Nirsoft’s website. Simply scroll to the bottom of the page and download the zip file which contains a standalone executable file. Once you have downloaded the program, create a folder on the desktop called FCV (or wherever you want to put it), and then extract the contents into the folder. Since FCV is a standalone application, there is no installation required. All you need to do is open the folder where the extracted files are and double-click the “FolderChangesView.exe” file. Remember that you may need to allow the application to run by clicking the “Run” button in the “Security Warning” window. Once you have opened the program, you will need to select the folder that you want to monitor, and then press the “OK” button. Once you press “OK,” the utility will automatically begin to monitor your folder and any sub-folders according to the parameters you define. For this example, we will choose to monitor the “Downloads” folder in Windows. Do this by changing the target folder as shown in the image below. 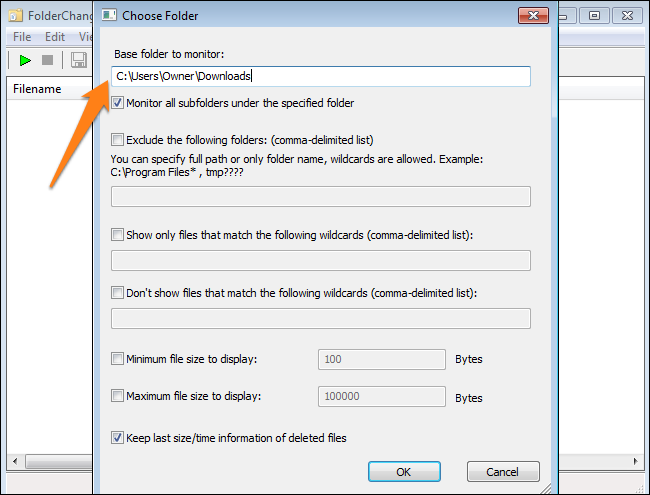 Once you have selected a folder to monitor, you can also choose to edit the monitoring parameters by changing any other settings shown in the screenshot. We will not use these for now, but you can experiment with them later on. These settings will not alter any files on your computer, so you will not need to worry about messing anything up by entering the “wrong” settings. Now that we have defined which folder will be monitored, it is time to make a change or two to see the way that the information is shown. For this example, I will delete a file from the folder, add a new folder, and move existing files into this new folder. “VirtualBox-4.3.20-9699…” was deleted and created. This indicated that the file was moved because it was created in the “New Folder” and deleted from the original “Downloads” folder. 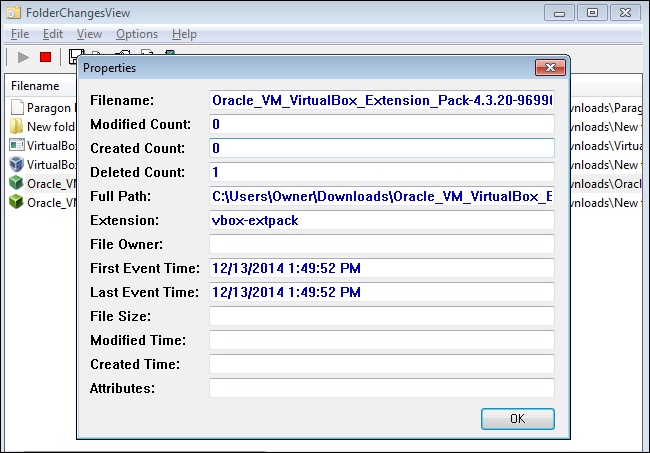 “Oracle_VM_VirtualBox…” had the same changes as the previous file because it was also moved. Modified Time (This is different from #8 and 9 since it tells you when the files attributes, name, and other details were modified rather than when it was accessed. Now that you know how to monitor file changes on your PC, you will never have to wonder what people were doing on your computer again. You can also track any changes that could have been made by malicious software to track it down and eliminate it. Feel free to play with the settings and change the monitoring folders to see what happens. If you ever want to remove the program, it is as easy as deleting the FCV folder since there was no installation required.